Shared on the official Super Smash Bros. Miiverse, Masahiro Sakurai posted this great closeup of Mega Man's Final Smash. He writes, "Mega Man.EXE and Mega Man Volnutt!! They only appear for a split second, but the modeling is so detailed. And if that’s the case…!" 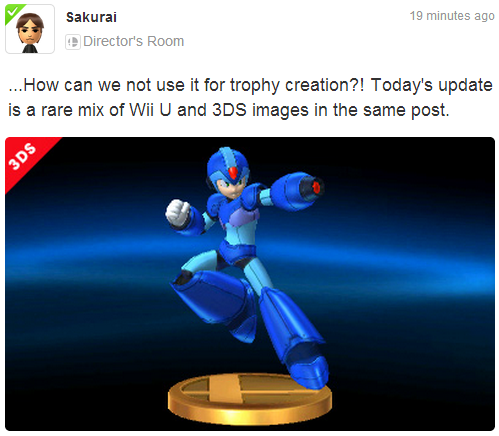 This caption quickly fueled hopes that Sakurai was about to announce alternate Mega Man costumes based on his four iterations, like Volnutt and .EXE. Unfortunately, though, that was not the case. See what it really means after the jump! Outside of Rock.EXE's tiny hands, these are sick looking. At first I expected the final smash of Megaman to be a short transformation to X but I'm satisfied with what we have. What would blow my mind is to have Zero as an assist trophy. That possibility is still there. Although (I know people are gonna hate on this) heh heh....I'd rather play as Zero. THERE I SAID IT! I liked to play as Zero in X4-5, Xtreme2, Tatsunoko vs Capcom and MvC3. Heck I even liked playing as his future self in Onimusha Blade Warriors and SNK vs Capcom Chaos. I just like the way he plays. I couldn't get into Megaman in Marvel vs Capcom, and I really couldn't get into Volnutt in TvC. EXE was alright in Blade Warriors (Capcom's Smash bros) so I guess he'd feel right at home in Smash. Zero does make more sense in a fighting game like this. Volnutt was difficult to master in TvC, but Rockman.EXE felt nice in OBW. In TvC, Volnutt was wicked good though once you got him down pat. Doing high hit combos with him solo (or an assist if you need it) just looks so stylish as opposed to several of the others in the roster. Now, now. Zero had plenty of time to fight. I personally don't buy the whole "Zero makes more sense in a fighting game" narrative, but even if I did I would still say let the blue guy have his chance. Also for Mega Man to get better, he needs to get a new moveset than his sub par, fairly creatively bankrupt moveset from MvC. Smash looks like a step in the right direction. We'll see how it turns out in the long run. @Anon3: That's fine that you think MM's moveset is "sub par' in the MvC series, but it was bigger than it is in Smash and was the influence for his move-set in that game in many ways. Smash, everything he has, his complete moveset known so far including normals = 17. How can you even compare that? MvC MM was even a sprite, meaning Capcom artist had to manually hand draw ever frame of animation for the guy, and he still has a large moveset inspired by his games. Not to even mention they are two completely different games. I don't even consider Smash a "fighting game" I classify it as a competitive platforming game. So having a large moveset in one might not be so good for the other. Can you imagine MM with BnB air combos, highly chainable specials and the ability to cancel a lot of moves like he does in MvC with his move set from Smash, while in Smash? He'd be straight broken. So please don't try and up play Smash for no good reason at all. Why would he transform into X? That would make about as much sense as Proto Man transforming into Zero. 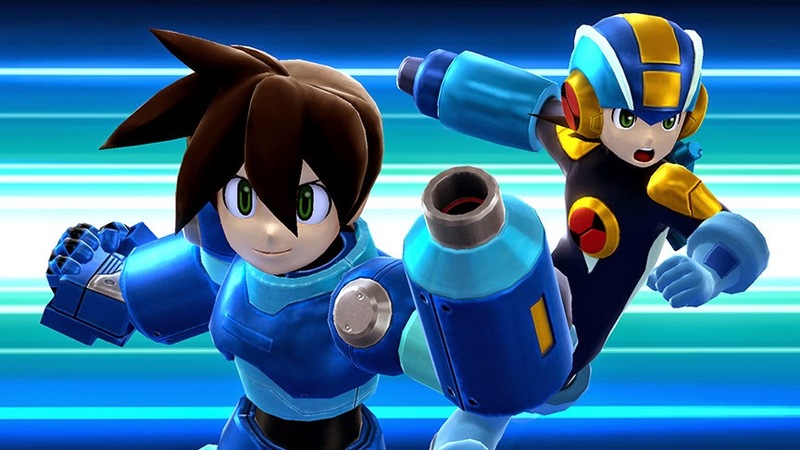 I would rather play as Zero because he is my favorite character, but I am happy with Mega Man being in the game. Like X, Zero will most likely be a trophy. They won't have any secondary playable Mega Man characters. I can tell because there isn't a secondary playable Sonic character. If they did have one, Shadow would be playable instead of an assist trophy. "Zero isn't in because he doesn't know WHAT HE IS FIGHTING FOOOOOORRRRRRRRR..."
Zero: "I have always only fought for the people I believe in. I won't hesitate... If an enemy appears in front of me, I will destroy it!" Seems like he's made up his mind. BTW old, joke is old. Zero: "I have always only fought for the people I believe in. I won't hesitate... If an enemy appears in front of me, I will destroy it!" and it took him over a hundred years to know that. Well seeing as how he was doing that right after killing Iris (and before to be frank), I'd say no. Weil asked a question (cause he was about to get a whoopin again), Zero simply answered it. I'm not sure why anyone assumed these would be alt costumes. The amount of work they would have to do for the hit spheres would be far too much. I'm actually glad they're not alternate costumes. It's bad enough that most people keep thinking these guys are all the same character, and having them as alt costumes would just reinforce that misconception. And there are other similar characters that could be alt, like Sonic/Shadow, not to mention the similar Mario/Luigi who originally were pallette swaps that later gained differences, plus the more different Wario and Waluigi. And the trophies description could give some clarity on their differences. I hope these can still be alts. Such a tease and fantastic work there. Glad the game is getting cross-game third party references. As already said a few times over, no way these guys could be alts for Mega Man, given the vast difference in size and build between the classic one and the rest of the team. It's still awesome that they went above and beyond to include them in some form! Honestly I can't wait to see what they do for Mega Man's alternate special moves, I'm sure they've squeezed in a few more (but similar, given the explicit note on the customization thing that only Palutena and Mii Fighters have completely different moves as options) master weapons in there. Their models are supposed to look good because they're all part of Mega Man's Final Smash. Similarly, the Darknut Zelda controls has a good, detailed model as well, because it's part of her attacks.